is the global market leader in Mobile Café Franchising, with over 200 successful franchisees worldwide. The core business of a Cafe2U franchisee is to develop and service business parks, business centers and industrial estates on a daily basis. These areas are traditionally poorly serviced by cafes and food outlets, in particular those able to provide high quality espresso based coffee. 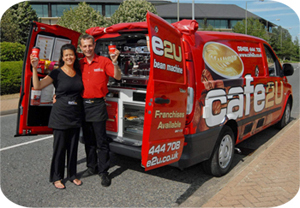 The Cafe2U franchise system has been designed to be a successful weekday business. Cafe2U franchisees typically start their business day around 7am and are finished by early to mid afternoon. The other component of the Cafe2U business model is event work. This normally takes place on the weekends, however franchisees may also service private and corporate functions on weekday afternoons. Weekend events include football, baseball, soccer, school activities, street fairs, community and charity events. Basically, anywhere there is a gathering of people in need of high quality espresso coffee is a business opportunity for you and your business. Event work can be very lucrative, however, given that the majority of event work takes place on weekends, not all of our franchisees choose to service events. The decision to service event work in entirely up to you and what you want to achieve with your business.On average our franchisees service between 20 – 30 loyal businesses within their territory each day, of which they aim for no less than 6 transactions per business. Our research has indicated that our franchisees are more successful targeting businesses with staff levels between 6 and 49 employees. So, what are you waiting for? Connect with the world’s largest mobile coffee franchise that brings forth range of coffee franchise opportunities for the people, offering them extensive training and support. Accelerate your coffee business by joining the expert team now and serve your customers with hot delicious espresso coffee.